Does the busyness of life crowd your time for quality connection? Do you find your mind constantly in PROBLEM solving mode? Need a little help to break through and break free from the mundane? In this powerful online course, A Higher Way of Thinking, Greg and Julie share power-packed principles, filled with next-step actions to help you live purpose-focused, not problem-focused in your marriage. Each week you’ll uncover insights to create new habits of thought in your relationship. 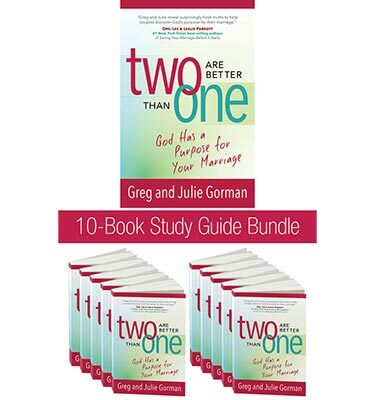 This course is designed to help you enrich your communication and unify physically, intellectually, emotionally, and spiritually with your spouse. Join us for weekly interaction as we unpack 10 principles to welcome NEW HABITS of THINKING for your life and marriage. A Higher Way of Thinking (module three in our membership series) is a stand alone video driven course for couples providing 10 video messages, each message provides a downloadable participant guide for the accompanying video. Simply print it out and begin holding deeper more meaningful conversations with one another. The participant guide correlates with the video lesson and provides a place and space to capture your thoughts.